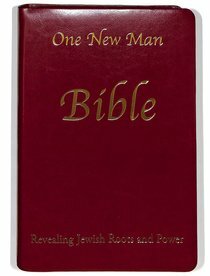 About "One New Man Bible Synthetic Leather"
The One New Man Bible will help the Church understand and appreciate its Jewish Roots, and finally recognize that Y'shua (Jesus) was born Jewish, that He grew up Jewish, and that He is the same today as He was then. (Hebrews 13:8) Readers will understand that the Scriptures Y'shua, and every New Testament author, embraced (irreverently called Old Testament by the Church) are alive and relevant for believers today. As a proof of God's perfect plan for His perfect Word, readers will discover that Matthew flows, as if a continuous stream, out of the book of Chronicles. Only God could have done this! Reverend William J. Morford is President of Shalom Ministries, Inc. He and wife Jeanie, have been ordained in the prophetic by Christian International of Santa Rosa Beach, Florida. They travel, teaching on the Church's Jewish roots and the prophetic.